Whilst many will focus on President Obama delivering the State of the Union on Wednesday, the other big event of this week is the nominal deadline for those adhering the Copenhagen Accord to submit their national targets and actions for logging in the appendices of the document. Although the UNFCCC have indicated that January 31st is a “soft deadline”, we may nevertheless see some movement in this space. The question is, “What will make a difference?”. The Accord offers two tables as appendices, one for developed countries to offer up absolute reduction targets through to 2020 and a second for developing countries to propose their own nationally appropriate mitigation actions. 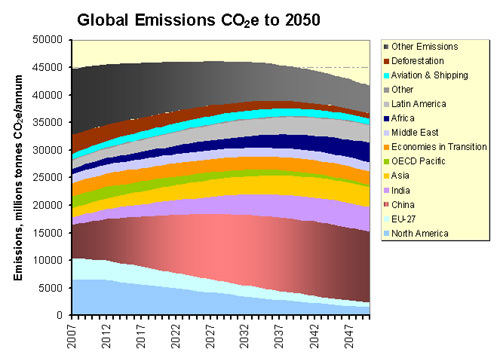 Without getting into the very specific details of what each country might specifically propose, it is useful to look at the trends that are developing in terms of direction and then see what impact this has in terms of total global emissions if continued through to 2050. For most OECD countries, the general direction is of the order of an 80% reduction from current levels by 2050, although there will be some use of offsets along the way and reductiosn will be quite limited through to 2020. For the rapidly developing economies, a reduction in CO2 per GDP seems to be one metric and prior to Copenhagen China suggested a 40-50% reduction from 2005 to 2020. So let’s imagine that other major economic blocks also take on a similar approach (for energy related emissions), say India, the rest of Asia (not Japan or Korea) and Latin America. 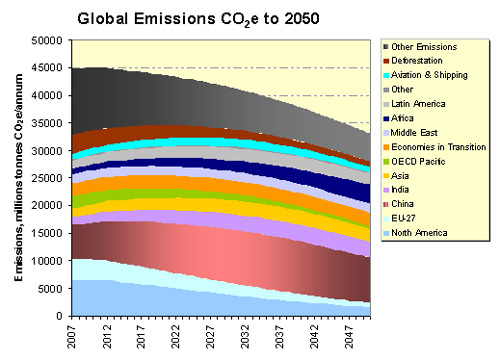 Let us also assume that the Middle East and economies in transition (mainly the former USSR) pledge to plateau emissions at current levels and the aviation and shipping industries offer to manage overall emissions growth such that by 2050 it is back to current levels and falling. African countries continue to grow at about 3% p.a. For non-energy emissions assume that deforestation and all other emissions (methane, cement CO2, various industrial gases and so on) are reduced significantly over the next 40 years. Case 1: China growth at 6% p.a. through to 2050, with a continuous 4% p.a. reduction in energy CO2/GDP (equivalent to 45% reduction from 2005 to 2020). India is also at 6% p.a., Asia and Latin America at 5% p.a. but all with a 3% p.a. decline in energy CO2/GDP (equivalent to a 35% reduction from 2005 to 2020). Deforestation emissions drop by two thirds and other emissions are halved. Case 2: Growth the same as in Case 1, but the rate of decarbonisation vs. GDP for developing countries is increased by 1% in all cases, i.e. from 4% to 5% for China and 3% to 4% for the others. All other assumptions remain the same. Whilst all of this looks like a positive story and I think it is, it doesn’t necessarily get us out of the woods. Recently I wrote about the “trillion tonne challenge“. In these two cases, we reach the trillion tonne total by about the mid 2040s and mid 2050s respectively. Although the curves look quite different, the area under them doesn’t vary by a great deal. In addition, with significant emissions still to come through to 2100 in these cases, the trillion tonnes is well and truly busted, which is an indicator of going above the 2 degree C goal of the Accord. It isn’t until really aggressive numbers are used that the reductions start to bite and the 2 degrees target starts to come into range. Case 3: Growth is the same as Case 1, but for major developing economies the rate of decarbonisation per annum is equivalent to the long term growth rate of the economy. 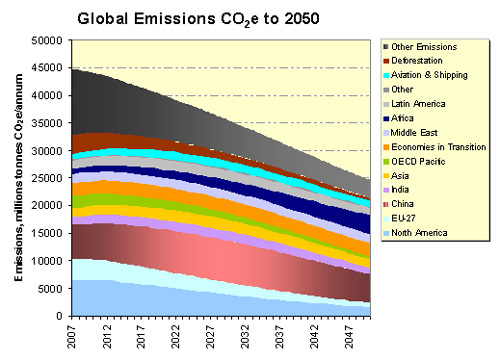 In addition, a much faster reduction of other emissions (i.e. non energy related) is achieved. The other assumptions remain the same. Whilst we are unlikely to see very aggressive reduction targets tabled this week, Case 1 shows that we may at least be in the “plateau” ballpark as a start. Later on, if a CO2/GDP approach persists, the annual reduction must be similar to long term growth. Another clear message from all this is that apart from energy, it isn’t just deforestation that is important. The broader management of all greenhouse gases from all sources will be critical. But what will it all cost? We all love technology, but not so sure about science!